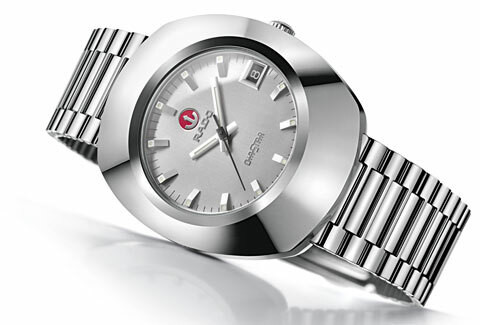 In 2012, Swiss watch brand Rado celebrates the anniversary of the legendary Rado DiaStar model. Over the course of a half century, a deep-rooted desire to create lasting beauty has repeatedly led Rado to develop breakthrough materials, including hardmetal, high-tech ceramic, high-tech diamond and Ceramos™. First presented in 1962, the striking design and unprecedented use of hardmetal in the Rado DiaStar established the brand’s reputation as an innovator and industry benchmark for durability and iconic design. The Rado DiaStar was inspired by a unique vision and the desire to transform purity and beauty into a watch of unparalleled durability and resilience. This desire challenged the skills and imagination of the Rado designers: In theory, hardmetal’s exceptional physical properties—its ability to withstand extreme compressive pressure and its resistance to oxidation, mechanical and thermal stress—made it an appropriate material for a scratch-resistant watch case. In practice, hardmetal proved extremely difficult to work with, and it would take all of the brand’s visionary audacity to achieve success. In the end, the revolutionary design showed how the use of a new material could help create a new aesthetic ideal. The design of the Rado DiaStar, and of all Rado creations since, underscore the intrinsic qualities of the materials used, which in turn enhance the visual richness of the watches. The Rado DiaStar was the crowning achievement of years of pioneering experiments and trials devoted to the development of new shapes and surfaces. A composite made of tungsten carbide powder and a metal binder, hardmetal is moulded and pressed at a pressure of 1,000 bar to form the rough case, which is then sintered in a vacuum furnace at 1,450°C. This process resulted in an incredible hardness of 1,400 to 2,000 Vickers, and brilliance, after polishing with diamond dust that would only add lustre. The concept requiring unprecedented hardness led to a new emphasis on the glass as well, which needed to be as robust as the casing. Sapphire crystal proved to be the solution, with the result that the Rado DiaStar, and all Rado watches since, feature sapphire crystal. In 2012, Rado celebrates the 50th anniversary of the Rado DiaStar with a replica edition. Made of hardmetal and sapphire crystal, like the first edition in 1962, the Rado DiaStar Anniversary Edition is offered in a limited and numbered edition of 1,962 pieces. The Rado DiaStar pays tribute to the power of a visionary idea and to the courage it required to make it real. A timeless inspiration, it is presented in a special, classic deep green coloured Rado watch box, inspired by the original from 1962. Included with this limited edition timepiece is a pair of cufflinks with an integrated Rado signature moving anchor symbol. Folded stainless steel Novavit style, stainless steel spring buckle with pushers.